We can restore or reproduce antique, vintage and rare statuary, ornate frames, altars and Stations of the Cross. We are currently adding new items to our custom-works pages (see the links below). Please get in touch to find out more about what we can create for you. Statues Plus is pleased to announce the opening of Duméy Studios. 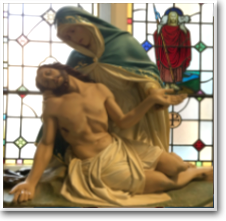 This addition to our business provides custom-made, one-of-a-kind religious statuary and Stations of the Cross. Select one of our images or provide your own and we'll sculpt a clay model for your approval. Once approved, we'll create the finished statue in either fiberglass or marble. Custom statues are available in sizes from 3 feet to 10 feet high. DuMéy Studios' other specialty is replicating vintage Stations of the Cross sets. You choose your frame and images (styles and size). If you have your own set of images, we can replicate those as well. Station sets are available from Chapel to Cathedral size. We've added a new selection of semi-custom Stations. 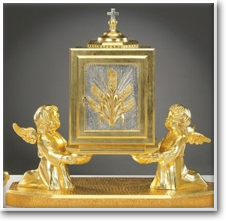 Available in polychrome, stone or bronze, these come in chapel and cathedral sizes (matching wall mounts available). New! We now offer a line of Christian Jewelry items (medallions & crucifixes). These are available in silver, gold or platinum finishes in various sizes. Your statuary can always be restored to the original artisan's vision of the piece. Let us bring your vintage and antique pieces back to their original glory. If your statue is missing a piece, is chipped, or showing signs of age, minor restoration work can take care of it. 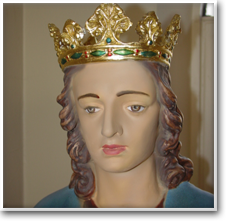 We also do meticulous, color correct restorations; removing layers of paint in select areas of the statue, documenting and matching the original color palette through Historical Analysis before repainting, then gold leafing ornamental areas, crowns and garment hemlines as needed. Gold leafing and other precious metals can be applied to most surfaces including wood, metal, stone, fiberglass and plaster. Consider a satin or reflective finish to select architectural elements on altars, pedestals, moldings, capitols and other items in your church.